The sun shines, the daisies bloom, the hedgerows stand tall. Early in the morning, distant machine guns chatter sporadically, and the boom of distant explosions rumble in the sky. Thousand of men battle one another and die, in bravery or in cowardice, as Heroes or simply as men. In our story, we leave out the extras and focus in on the Heroes who populate the classic Hollywood war movies, from the supporting actors up to the stars. A Bridge Too Far, The Longest Day, Patton, Kelly's Heroes, Saving Private Ryan. 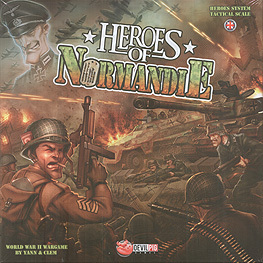 These films are our inspirations, and this is what we have given you in Heroes of Normandie! In order to reproduce the atmosphere of these timeless movie classics, we stepped up the pace of the traditional war game. We have provided you with everything you need to make even the smallest scene explosively exciting! We want you to grin with delight as you mow down those invading GIs with your MG42, or when you bombard those Nazi swine with your bunker smashing mortar fire!